Stimulating telomerase and increasing telomeres are without doubt the most promising ways of increasing life expectancy naturally. Animal and in vivo tests show that cycloastragenol is one of the very few substances - and the most powerful - that can appreciably increase such activity. ¤ Cycloastragenol is a saponin comprising a group of oil glucosides naturally present in a number of plants. It is extracted and purified from the root of the plant Astragalus membranaceus, which has been used in Chinese pharmacopaeia for thousands of years, particularly for its ability to slow down age-related degenerative processes. However, cycloastragenol is present in astragalus in minute quantities and extracting it is a highly complex and costly business. 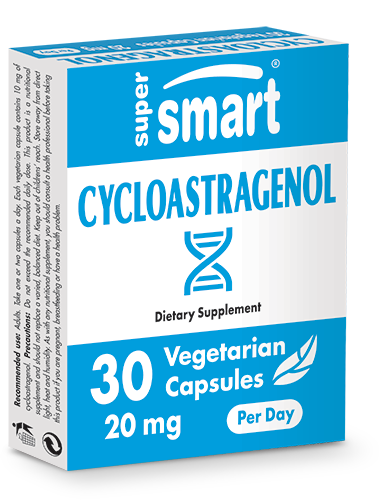 ¤ Cycloastragenol has a similar chemical structure to that of the Astragaloside IV molecule, but it is smaller and significantly more bioavailable, enabling lower doses to be taken. It is already used as an immunostimulant because of its ability to increase T lymphocyte proliferation. However, it is its exceptional anti-aging properties that are of increasing interest to the scientific community. Cycloastragenol stimulates the repair of DNA damage by activating telomerase, a nucleoprotein enzyme which catalyses synthesis and growth of telomeric DNA. Telomeres are made of thin filaments and are found at the tips of chromosomes. Maintaining their stability enables cells to avoid replicative senescence and indefinite proliferation beyond the Hayflick limit'. Telomeres shorten with each cycle of cell division, or when subjected to oxidative stress. Until now, this has been an unavoidable mechanism of aging. ¤ Recent studies have shown that shortened telomeres are responsible for a number of age-related diseases and are also predictive of premature death in elderly subjects. This has been confirmed by examining the immune response of T lymphocytes in terminal-phase infection, the T lymphocytes having significantly shortened telomeres. The study showed a noticeable fall in immune function and increased secretion of various cytokine-related pro-inflammatory factors. In contrast, maintaining a high telomerase level, whether through genetic manipulation or through the introduction of activating substances (such as cycloastragenol), curtails shortening of telomeres and even increases their numbers, restoring a more youthful T lymphocyte profile. ¤ Cycloastragenol can be combined with Astragaloside IV, to provide a wider spectrum of activity, or it can be alternated with it. We are not yet at a stage of being able to recommend taking both products together, every day, for long periods. However, no intolerance has been reported to date. For more information on how to take it, see the "anti-aging" section. To provide effective and long-lasting support in the fight against premature ageing, other anti-ageing products may also be of interest. For example, our resveratrol supplement is a powerful natural antioxidant with recognised protective effects, while saikosaponin A is a promising compound in the field of anti-ageing medicine. Take one or two capsules a day, or as advised by your therapist. Each capsule contains 10 mg of cycloastragenol.